After a couple of posts about license plates, it seems appropriate to follow up with one of my road photos ... and it made me ponder which Montana road might actually be my favorite. I can't answer that question for certain -- there are way too many Montana drives that I love -- but this little road is as close to being my favorite as any. 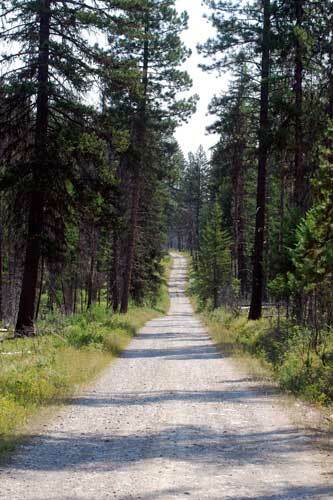 This is a shot of the Inside North Fork Road, up in Glacier Park. Running north from Apgar almost to the Canadian border, the road predates the park's establishment, connecting a series of remote lakes, tiny campgrounds, and log ranger stations ... and many days you can drive it for hours without seeing another soul. It's the antithesis of the overcrowded Going-to-the-Sun Road, where interactions with people and cars sometime overshadow the wonderful setting, and it's why the North Fork country is my favorite part of Glacier.